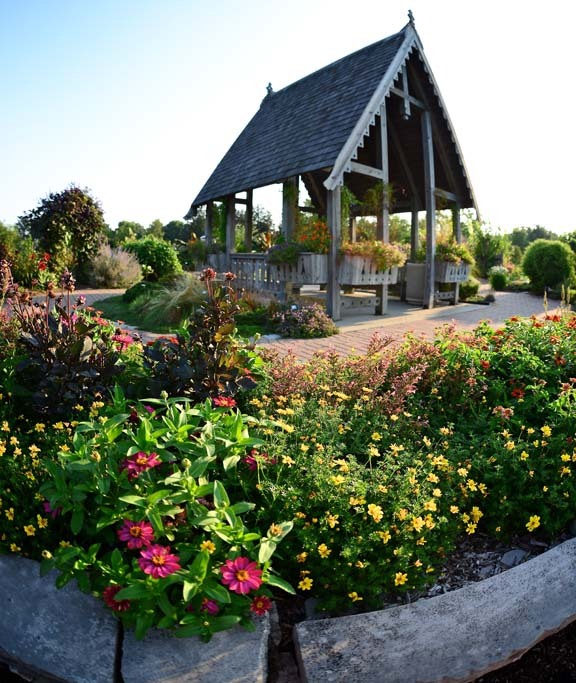 The Idea Garden is an ongoing project of the Master Gardeners of the Champaign County Extension Unit. The garden showcases the latest in borders, ornamentals, and vegetables. In addition, there is a special section of the garden for children. Detailed resource information on plants and design ideas is available for each section of the Idea Garden, making it an ideal learning environment for both novices and more advanced gardeners. Master Gardeners continue to sacrifice time from their own gardens to bring this wonderful resource to campus and community. The Idea Garden is a delightful place to walk, to get ideas for your own garden, or just to relax in the gazebo with a friend. The Idea Garden is located within University of Illinois Arboretum on south Lincoln Avenue in Urbana, just south of the corner of Florida and Lincoln Avenues. The garden highlights different garden themes including vegetables, children's garden, rock garden, rose garden and berry garden. The gazebo is in the center where the window boxes explode with color. The garden is surrounded by a picket fence and a mixed shrub, ornamental grass and flower border. Bring your pad and paper because you will surely want to jot down some plants that catch your eye. Master Gardeners work in committees to design, plant, and maintain each area. In addition operating expenses come from Master Gardener fund raisers, mainly the annual Garden Walk. The garden changes each year and through the seasons. The purpose of the garden is to demonstrate growing methods useful for home gardeners, highlight new plants, show design principles and provide a relaxing place to stroll. From the beginning the Idea Garden's main focus was education. The gardens are used for tours, as a teaching tool for U of I classes and a learning place for novice gardeners as well as Master Gardeners. You will find Master Gardeners working in the garden just about anytime with the main workday as Saturday morning. Stop by, say hello, maybe ask a question or two and let them know how you feel about the garden.